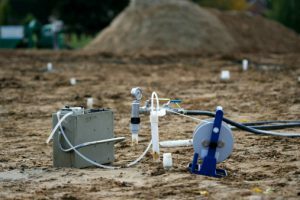 The environmental liabilities associated with owning or managing properties require buyers and sellers (as well as lenders, brokers, agents, developers, appraisers, landlords, tenants, attorneys, and portfolio owners) to conduct diligent inquiry into the environmental condition of a property through an Environmental Site Assessment (ESA). The process of the inquiry is generally broken down into three separate phases depending on the type of assessment needed. Phase I ESA – Identifies potential areas of environmental concern through a review of historical records, regulatory records and site reconnaissance. Following the protocols of the ASTM E 1527, QUEST personnel will develop a history of the site and past practices, conduct a site visit to determine if there is any visual evidence of contamination, interview regulatory agency representatives, and generate a report detailing potential areas of environmental concern. Phase II ESA – Confirms, quantifies, or nullifies the areas of concern identified in a Phase I. The focus of the Phase II is to obtain quantitative evidence of the presence of hazardous substances and determine precisely the scope of contamination. Remediation options are defined and their costs can be delineated to assist the client in making future business and remediation decisions. Phase III ESA – Remediates any concerns confirmed and quantified in a Phase II. QUEST provides technically sound, efficient, and cost-effective approaches to property remediation. QUEST services include project design, pre-contract bidding, contractor screening, project oversight and monitoring, post-remediation assessments, and coordination with interested parties and regulators. QUEST is available to test unknown residues, soils, groundwater, or surface waters for contaminants, compliance with applicable regulations and standards, or usage suitability. QUEST provides a range of solutions, including strategic risk management, liability transfer, liability assumption, capital sourcing, and transaction structuring. As owners of sites with environmental liability ourselves, we approach transactions from a principal point of view. We are committed to providing excellence in environmental consulting, engineering, and project oversight services to our clients, with the focus on solution-oriented approaches coupled with cost effectiveness. QUEST has an excellent working knowledge of federal and state environmental regulations and maintains good working relationships with representatives of numerous health departments, CDPHE, Colorado’s Voluntary Cleanup Program, the Environmental Protection Agency, the Brownfields industry, municipalities, and numerous experts within the public and private sector. On behalf of our private equity clients, QUEST has provided environmental risk assessment and management services, including assessments for hundreds of Brownfield sites throughout the Unites States, Canada, and Europe. QUEST services include environmental assessments, strategic risk management, financial modeling projections, the development of environmental operations and maintenance programs, ISO 14000 environmental management systems development, deal sourcing, negotiating acquisitions, ongoing project management, subject matter expertise, and litigation support. Based upon our recommendations, our private equity clients have invested billions of dollars in corporate and land acquisitions.